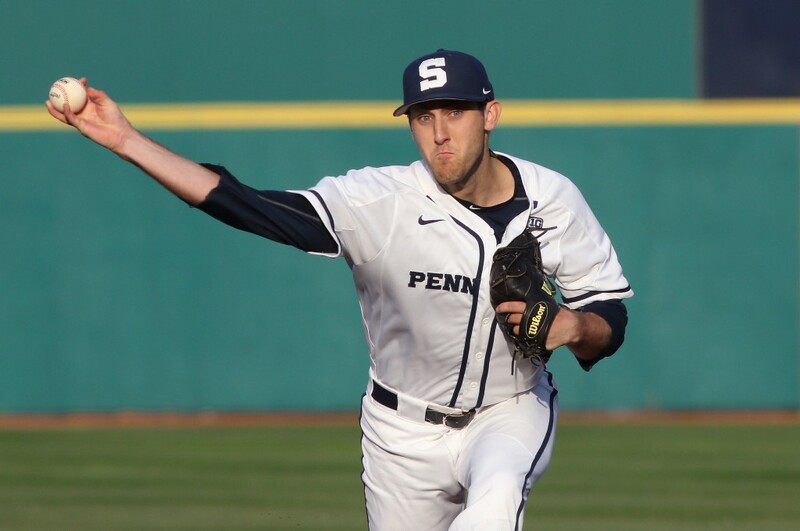 A former pitcher with Bishop Eustace Preparatory School and currently a junior at Penn State, Hagenman was taken in the 23rd round of the draft on Wednesday. Bishop Eustace Preparatory School pitchers have been making quite the impression on pro baseball scouts in recent years. In 2015, the Texas Rangers drafted pitcher Tyler Phillips out of Bishop Eustace. In 2016, the Los Angeles Dodgers selected another former Crusader, Devin Smeltzer, in the fifth round. Last week, Justin Hagenman, a junior at Penn State and 2015 graduate of Bishop Eustace, joined his former teammates as an MLB draftee. Hagenman, a Voorhees native, was selected in the 23rd round of the 2018 Major League Baseball Draft. The Los Angeles Dodgers selected Hagenman with the draft’s 704th overall pick. Hagenman said he had been talking to the Dodgers through the draft’s third day, so he knew they were interested in him. In the middle of the afternoon last Wednesday, Hagenman received some good news heading into the 23rd round. “They called me and they let me know they were probably going to take me with the next pick,” he said. Hagenman was drafted after showing a ton of improvement in 2018 with the Nittany Lions. In 2017, Hagenman finished the year with a 5.49 earned run average ,with opponents batting .308 against him. This year, Hagenman’s ERA dropped to 4.60 and opponents hit just .268 against him. Additionally, Hagenman finished eighth in the Big Ten in strikeouts with 76. Hagenman is a different pitcher today than he was in high school. While he used his mastery of multiple pitchers to get hitters out at Bishop Eustace, he now possesses greater velocity on his fastball, giving him an extra weapon to strike out Big Ten batters. Hagenman has been a starting pitcher all three of his years at Penn State. As a freshman, he had a 6–3 record and a 3.84 earned run average in 14 starts, earning a spot on the Big Ten All-Freshman team. It wasn’t until his sophomore year, however, when Hagenman became more of a strikeout pitcher. After striking out 36 batters in 2016, Hagenman more than doubled his total to 75 in 2017. In high school, Hagenman was a named an All-Olympic Conference player multiple times and won 11 games on the mound between his junior and senior years. During his final high school season in 2015, Hagenman finished with a miniscule 1.30 earned run average. During the college recruiting process, Hagenman received interest from multiple schools, but was drawn to Penn State. An economics major, Hagenman spoke highly of the academics and the atmosphere at Penn State. Hagenman shares a number of things in common with his former teammate Smeltzer, who is currently pitching with the Dodgers’ AA minor league affiliate in Tulsa. Hagenman and Smeltzer grew up together in Voorhees, played baseball at the same high school and were now drafted by the same organization. Hagenman has not yet made a decision on whether he will join Smeltzer and sign with the Dodgers or return to Penn State for his senior season. He plans to talk more with the Dodgers, his family and his coaches before making a final decision.